People Thoughts – Yet another windows phone from Nokia is going to hit the market soon in June 2013 named as “LUMIA 930”. While there are many other windows phone from Nokia, already present in the market, this phone is expected to rule over them and may give a tight competition to its other rival smartphones as it is equipped with an awesome 20 Mega Pixel Camera and Snapdragon 800 chipset. Whereas on the other hand, India’s leading smartphone brand ‘Samsung’ has already launched its smartphone “Galaxy S5“. It is equipped with latest Android operating system ‘Android Kitkat’ embedded with Snapdragon 801 chipset and also has water resistance feature with 16 Mega Pixel auto focus camera. This phone looks similar to its predecessor ‘Galaxy S4’. Average Ratings – Nokia Lumia 930 is an awesome choice for those who want to go in separate direction rather than to follow the android trend. This phone has a sleek design and is equipped with 5 inch super AMOLED capacitive touch screen with great resolution of 1920 x 1080 pixels, a 20 Megapixels autofocus zeiss camera + 1.2 megapixels front camera and has a decent design with aluminium frame. But on the other hand it has several limitations such as no micro SD card support as it has already 32GB internal memory, so SAGMart gives it a overall rating 4.5 out of 5. While on the other side Samsung Galaxy S5 has a better chipset than Nokia Lumia 930 resulting in a better processing power. It also has 5.1 inch super AMOLED capacitive touch screen with same resolution as that of Nokia Lumia 930. It also has a better front camera of 2 Megapixels, fingerprint recognition and a heart rate monitor feature also. But also, it has several limitations like having same old design similar to that of other Samsung phones and slow background defocus, So SAGMart gives it an overall rating 4 out of 5. Market Value – Nokia Lumia 930 is soon arriving in the market for its lovers. Although it is equipped with the latest windows OS, awesome Camera and built in Wireless charging, it has a surprisingly economic market value of Rs. 35,000. While Samsung Galaxy S5 has many attractive features like water resistance, fingerprint scanner and heart rate monitor which brings its price upto Rs. 51,500 in India. Nokia Lumia 930 has a huge number of applications available for its users. It also has a great battery life and camera quality apart from the limitation of no memory card support. Also it has a stylish screen design which makes it more attractive than other Lumia phones. Therefore it has its value in accordance to the features provided. Whereas in Samsung Galaxy S5, having the old and boring design like its predecessor, it is also the first phone to introduce the fingerprint scanning feature. It also has a great battery life and latest processor chipset which brings its price higher than that of Nokia Lumia 930. Advance Options – Nokia Lumia 930 has a full HD display of 1920 x 1080 pixels with super sensitive touchscreen. It is equipped with 20 Megapixels autofocus zeiss camera embedded with LED flash with pure view. It also has a 2.2 GHz Quad Core processor with Qualcomm Snapdragon 800 chipset , 2 GB RAM, battery of 2420 mAh, latest windows OS(Windows Phone 8.1) and has the overall dimension of 137 x 71 x 9.8 mm and weight of 167 gms. Whereas Samsung Galaxy S5 has 5.1 inches super AMOLED capacitive touch screen with 432 PPI (pixels per inch) quality (1920 x 1080 pixels) and is equipped with the latest Android OS version 4.4.2 (Kitkat). It has a less quality camera than that of Nokia Lumia 930 (only of 16 Megapixels) but has a front camera of 2 Megapixels. It has Octa core processor Adonis Prime2 (Quad 1.9GHz + Quad 1.3GHz) with Qualcomm Snapdragon 801chipset, 2 GB RAM, battery power of 2800 mAh and has overall dimension of 142 x 72.5 x 8.1 mm and weight of 145 gms. Verdict – Nokia Lumia 930 is a great package comprising of brilliant quality camera, sleek designed wider screen and high internal memory in a comparably affordable price, this phone is going to rock when it hits the market. Samsung Galaxy S5 is another option for the users who want a smartphone comprising of wider screen with great resolution, advance processor, latest chipset and long battery life. 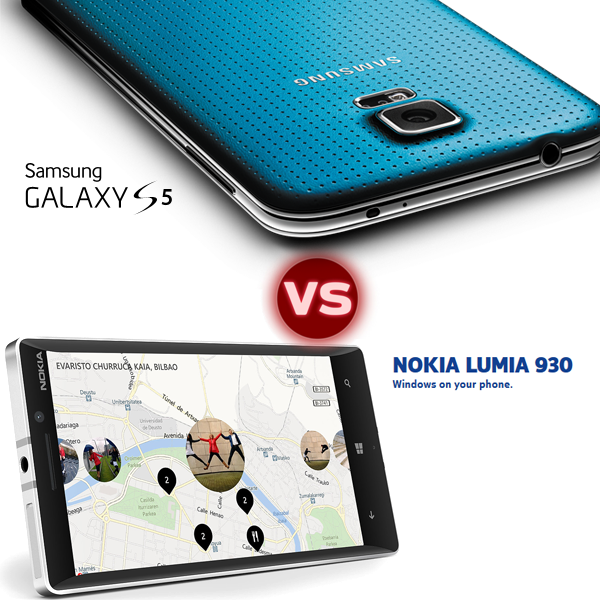 Although having a high market value, it is surely going to attract many of the users and may beat Nokia Lumia 930.